No Mas! brings Mexican photorealistic painter, Cesar Plascencia, to Atlanta’s Castleberry Hill Art Stroll, November 11, 2011, which runs 7-10pm. The vivid, expressive paintings of Cesar Plascencia, who was personally trained by the renowned artist David Villasenor, will be on display at No Mas! this November, with the artist’s trip to Atlanta sponsored through combined efforts of No Mas!, the Instituto de Mexico, and the Rialto Center for the Arts. During his stay, Cesar will complete a new painting at No Mas!, where patrons may watch his technique. While No Mas! has been designing and importing handcrafted furnishings, decor, and art to Atlanta since 1996, they are embarking on their first invitation of a Mexican artist to visit the U.S.A. Cesar Plascencia, a painter of oils on canvas in the photorealistic style, has accepted No Mas! Hacienda & Cantina’s invitation to visit the U.S.A. and participate in Atlanta’s Castleberry Hill 2nd Friday Art Stroll, November 11, 2011, which runs 7-10pm. His vivid, moving pieces, some already displayed in the No Mas! Hacienda showroom, depict the Mexican people and culture. Mr. Plascencia has chosen No Mas! Hacienda as his exclusive representative for the state of Georgia. No Mas! 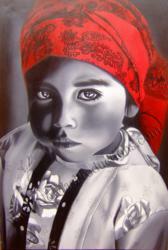 will proudly host his collection of paintings, titled “Colores de Mexico” (“Colors of Mexico”). The works will be exhibited during the tandem celebrations of “Dia de los Muertos” at No Mas! on Nov. 2nd and GSU’s Rialto Center on Nov. 3rd. The artist will be painting and communicating his inspirations to visitors both evenings and during the Nov. 11th Castleberry Hill Art Stroll (7 – 10pm) at No Mas! Hacienda. The collection will remain on exhibit for the entire month of November at both No Mas! and The Rialto Center for the Arts. While he is here in Atlanta, Cesar will be completing a very special painting of a small boy holding a candle at a traditional celebration of “Dia de los Muertos”; a beautiful and wonderful gift to see it realized during his stay here. As economic and political challenges have interrupted normal exchange with our closest southern neighbor, No Mas! has proactively sought to enlighten their guests by bringing fine Mexican Art and Culture to Atlanta. They hope the reception in Atlanta to be filled with southern hospitality.